Many geologic processes operate on time scales much longer than human lifetimes, or at very large or very small spatial scales, making the processes difficult to observe directly in a meaningful way. Computer simulations can provide students with the opportunity to observe, engage with, and explore these processes. In particular, students can enhance their understanding of geologic processes by changing input parameters for simulations and observing the effects on the output. These features make simulations powerful teaching and learning tools. However, effective use of simulations requires an understanding of their limitations, as well. "Congruence Principle: The structure and content of the external representation should correspond to the desired structure and content of the internal representation." For example, if you want students to be able to visualize fluvial downcutting, use a simulation that mimics that process. Animations are likely to be more effective in representing change over time than static images -- but only if they follow the apprehension principle. "Apprehension Principle: The structure and content of the external representation should be readily and accurately perceived and comprehended." Some animations may be so complex or so fast that they overwhelm our abilities to perceive what is happening. Interactive animations -- where the user can adjust input variables -- allow us to explore the processes, so that we can more easily apprehend them. Affordances: The simulation includes visual cues to what can be manipulated, and other scaffolding for learning. For example, if an input can be varied, there is a slider bar for the user to manipulate that variable. If an analogy would be helpful, it is built into the simulation. Constraints: Users are prevented from pursuing unproductive, distracting avenues of exploration. For example, natural phenomena are limited to realistic rates, frequencies, etc. While the user can explore the interactions of some variables, the complexity of these interactions permitted in the simulation is not unlimited. Simulation of shear waves in the Earth's mantle. Use simulations that provide structures for exploration, such as "concrete connections to the real world, representations that are not available in the real world, analogies to help students make meaning of and connect across multiple representations and phenomena, and a high level of interactivity with real-time, dynamic feedback" (Podolefsky et al., 2010). Ensure that technological needs are met (How to Teach with Simulations). Test drive the simulation to make sure that you know how it works and can help students when they get stuck. Be explicit about how using the simulation to answer your driving question(s) will help students meet the course learning goals, and hold each student accountable for their learning (How to Teach with Simulations). Direct connections to course learning goals and accountability can both provide motivation for student learning. Provide minimal guidance, to facilitate open-ended exploration. This can take the form of one or two "driving questions," questions about the challenging underlying concepts illustrated by the simulation. Students given these open-ended conceptual questions explore simulations much the way scientists explore: posing and answering questions to themselves, driven by their own curiosity, to make sense of the phenomenon being simulated. When more guidance is given, in the form of directions to explore specific features or variables, students actually explore less, stopping as soon as they have answered the specific questions in the "guided inquiry" activity (Adams et al., 2007). Use a constructivist approach, rather than guiding learners step-by-step. Ask students to make predictions, and to explain their predictions, prior to exploring the simulation to test their predictions. This approach is more effective than a prescriptive one for overcoming alternative conceptions (Windschitl and Andre, 1998). Two effective ways to accomplish this are via an interactive lecture demonstration or using cooperative learning techniques (How to Teach with Simulations). Incorporate post-simulation discussion, including time for student reflection (How to Teach with Simulations). Reflection and discussion can elicit and correct student misunderstandings while reinforcing key concepts. Students can observe processes that are otherwise unobservable. Scaled visual models allow students to "watch" processes they can't actually see in real time and space. Simulations can mimic interactions of (geologic) processes, thus helping students understand complex systems behavior. Simulations are engaging. Students can manipulate (and isolate) the input parameters to explore their effects (Perkins et al., 2006). This kind of use of simulations promotes deep learning (How to Teach with Simulations). Simulations allow hypothesis testing via prediction of outcomes (Jimoyiannis and Komis, 2001). Simulations allow students to make connections with everyday life experiences (Perkins et al., 2006). Simulations may include multiple representations (Jimoyiannis and Komis, 2001). As a result, effective use of simulations leads to improved learning outcomes (Jimoyiannis and Komis, 2001; Perkins et al., 2006), particularly when simulation outputs are visually realistic (Martinez et al., 2011). 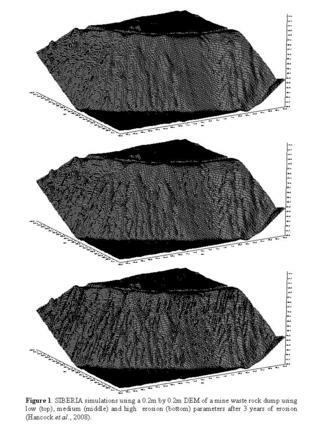 Figure 1: SIBERIA simulations using a 0.2m by 0.2m DEM of a mine waste rock dump using low (top), medium (middle) and high erosion (bottom) parameters after 3 years of erosion (Hancock et al., 2008). There are some important challenges to be aware of in using simulations for learning. No simulation can completely represent/reproduce complex, real world processes. In particular, simulations of geologic processes generally compress time and space. Teaching with simulations is therefore much like teaching with analogies. Nonetheless, students may see a model as a full representation of the world. Instructors may need to guide students through a comparison of the simulation to the real-world processes it mimics. What are the underlying assumptions of the model? Are the parameters all given reasonable ranges? "Creating opportunities for students to validate the model, i.e. compare model predictions to observations, increases their understanding of its limits" (How to Teach with Simulations). If the model output doesn't look "realistic," students may have a hard time applying what they learn from the simulation to the real world (Martinez et al., 2011). Effective use of simulations can require significant preparation by the instructor, who must thoroughly understand the simulation: how it works, what it mimics well, what its assumptions and limitations are (How to Teach with Simulations). Adams, W. K., A. Paulson, and C. E. Wieman, 2008. What levels of guidance elicit engaged exploration with interacive simulations: Proceedings of the 2007 Physics Education Research Conference (AIP Press, New York). Edelson, Daniel, 2001. Learning-for-Use: A Framework for the Design of Technology-Supported Inquiry Activities. Journal of Research in Science Teaching, v. 38, n. 3, pp. 355-385. Jimoyiannis, Athanassios and Vassilis Komis, 2001. Computer Simulations in Physics Teaching and Learning: A Case Study on Students' Understanding of Trajectory Motion. Computers & Education, v. 36, pp. 183-204. Martinez, Guadalupe, Francisco L. Naranjo, Angel L. Perez, Maria Isabel Suero, and Pedro J. Pardo, 2011. Comparative study of the effectiveness of three learning environments: Hyper-realistic virtual simulations, traditional schematic simulations and traditional laboratory. Physical Review Special Topics - Physics Education Research, v. 7, n. 2, 020111. National Research Council, 2000. How People Learn: Brain, Mind, Experience and School. National Academy Press Washington, D.C.
Pedagogy in Action. 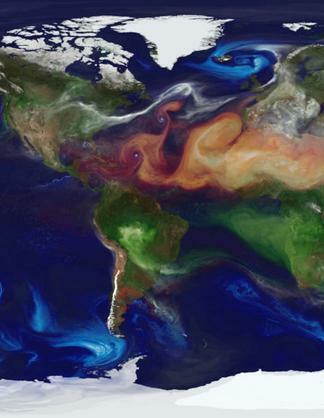 How to Teach with Simulations, Science Education Resource Center. Accessed 8 July, 2013. http://serc.carleton.edu/sp/library/simulations/how.html. Perkins, Katherine, Wendy Adams, Michael Dubson, Noah Finklestein, Sam Reid, Carl Wieman, and Ron LeMaster, 2006. PhET: Interactive Simulations for Teaching and Learning Physics. The Physics Teacher, v. 44, pp. 18-23. Piburn, Michael D., Stephen J. Reynolds, Debra E. Leedy, Carla M. McAuliffe, James P. Burk, and Julia K. Johnson, 2002. The Hidden Earth: Visualization of Geologic Features and their Subsurface Geometry. National Association for Research in Science Teaching annual meeting: New Orleans, LA. Podolefsky, Noah S., Katherine K. Perkins, and Wendy K. Adams, 2010. Factors promoting engaged exploration with computer simulations. Physical Review Special Topics - Physics Education Research, v. 6, n. 2, 020117. Snir, Joseph, Carol Smith, and Lorraine Grosslight, 1993. Conceptually enhanced simulations: a computer tool for science teaching. Journal of Science Education and Technology, v. 2, n. 2, pp 373-388. Tversky, Barbara, Julie Morrison, and Mireille Betrancourt, 2002. Animation: Can it Facilitate? International Journal of Human Computer Studies, v. 57, pp. 247-262. Windschitl, Mark and Thomas Andre, 1998. Using computer simulations to enhance conceptual change: The roles of constructivist instruction and student epistemological beliefs. Journal of Research in Science Teaching, v. 35, n. 2, pp. 145–160.